Time at the eyepiece has been scarce so far this year. And as yet, still no productive time at a dark sky site either. Thankfully we still have the Moon! 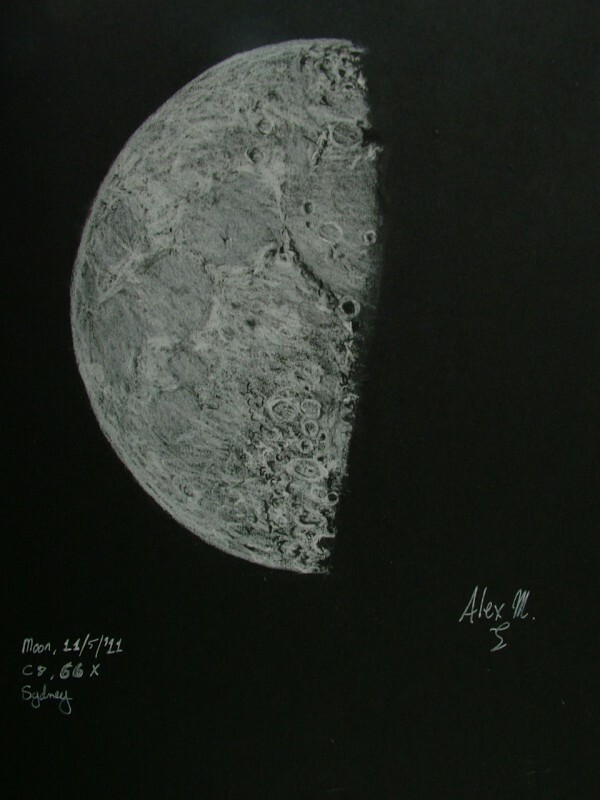 This one hour sketch of the first quarter phase of the Moon was a bit of a race. That was all the time I had before the Moon went behind the neighbour’s palm tree, plus conditions were cold and windy. I guess as close to “Extreme Astro Sketching” as I’d like to get to, LOL! This was also the first sketch undertaken with a real old girl scope, a beautiful early 1980’s orange tube C8. No GPS, no periodic error control, no Go-to, no special lens coatings, doesn’t even make me coffee. Just a little clock drive. Cool. Media: White and black charcoal pencils, white and black Chinagraph, & graphite pencil on A4 size black paper. Way to go fella. Now that is a nice whole Moon sketch.